I love my breakfast of Greek yogurt topped with fresh fruit and granola. It’s pretty much the only thing I can handle that early in the morning (besides my mandatory cup of coffee of course!). But buying gluten free granola can be really expensive and I was looking for something that had a really great sweet, cinnamon flavor. After a bit of searching, I came across this basic granola recipe that had the flavor I was looking for. I halved the recipe, and then made a couple of adjustments to some of the measurements since I wanted to add almonds. I also decided to use regular flax seed instead of the ground flax seed as that was what I had on hand and I was too lazy to grind it that day. The result? 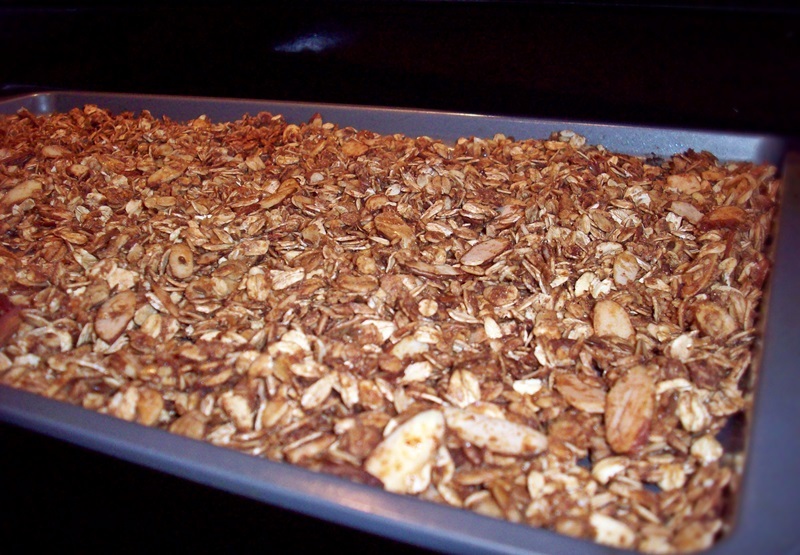 A simple, nutty, sweet, cinnamon granola that tastes fantastic on my morning yogurt. The Dude and I are also known to eat it plain as a quick snack. It’s that good! Preheat the oven to 300 °F. In a small bowl, melt the butter in the microwave. Add the honey to the melted butter and stir to combine. Meanwhile, in a large bowl, combine oats, cinnamon, brown sugar, salt, almonds, and flax seed. Pour butter/honey mixture over the dry ingredients and stir well to combine. Spray a large cookie sheet with cooking spray and spread the granola out in the pan. Bake for 30 minutes, stirring every 10 minutes. Remove the granola from the oven and let it cool on the cookie sheet. Once it’s cooled, break it into smaller pieces and store it in an air tight container. This recipe usually lasts our family 1 ½-2 weeks. Feel free to add other things to this like dried fruit or other nuts and let me know how it turns out! Bacon, Veggie &… on A New Adventure! Michaelle on Why Start A Blog?